On a trek in the Garhwal Himalayas, BT’s Anusha Subramanian comes back with lessons in micro-financing and community-owned tourism. It started off as my much awaited trek in the Garhwal Himalayas and turned into an impressive first-hand account of a small, yet smart, initiative. The setting: Nanda Devi Sanctuary Trek against the backdrop of the spectacular 7,816-metre Nanda Devi peak. But first, a peek into the history of this trek that has a direct bearing on the present. The Nanda Devi Sanctuary Trek retraces the pioneering steps of mountaineers Eric Shipton and H. W. Tilman through the Garhwal Himalayas in 1934. It’s their exploration of the inner sanctuary that set the stage for all subsequent mountaineering expeditions. That was till 1982 when the region around Nanda Devi was declared a national park and all human activity banned inside the inner sanctuary. The well-meaning conservation efforts had a devastating impact on the local economy. In this backdrop, the Nanda Devi Campaign, led by the locals, was launched in 1990s. After a long struggle, in 2003, the region saw the opening of the Nanda Devi Biosphere Reserve (NDBR) for limited ecotourism activities. The people of Nanda Devi, however, faced the daunting prospect of managing a community-based tourism trade with few of the resources, experience, and expertise enjoyed by the big tourist agencies. This struggle has now moved into its decisive phase. And the big challenge? Capacity building and training of local youth—to ensure that the gains of this labour are not lost on the community. Taking up this challenge is Mountain Shepherds headquartered at Lata village in Chamoli district— a cooperative initiative that was born out of the Nanda Devi Campaign. To begin with, Mountain Shepherds has taken upon itself to train the local youth from Uttarakhand Himalayas at the prestigious Nehru Institute of Mountaineering (NIM), Uttarkashi, to become local guides, porters and technical experts in search and rescue operations during trekking expeditions in the Garhwal Himalayas. To this end, Mountain Shepherds also directly plans treks to the sanctuary and takes care of your trip right from the time you land in Delhi. Thus our trip to the sanctuary was also ensured in association with Mumbai-based Odati Adventures. From our first halt at Rishikesh, we are driven to Joshimath where Mountain Shepherds has a homestay facility. 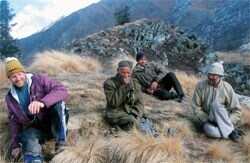 Here, we are introduced to our trek manager, Mangal, and his team of three main leaders— Lakhpath, Hookie and Govind. These local boys were among the first batch of 38 boys to get trained at NIM, through Mountain Shepherds initiative. 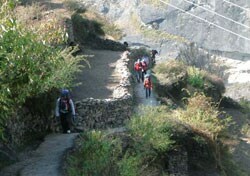 During the trekking season (June to October), the local boys earn about Rs 20,000-25,000 through portage. Their families earn similar amounts through selling carpets and about Rs 10,000 through homestays. Of this, Mountain Shepherds—which will soon be converted into a private limited company—earns a minimal profit, which it then gives back to the locals in the form of micro-financing. One such local boy, Mukesh, drove us from Rishikesh to Joshimath and thereafter, to Lata village in his own vehicle that he had bought through micro-financing. After an overnight stay at Joshimath, we are driven 25 km to Lata Winter village. At Lata, we also meet our 15-member porter team. Among these are experienced expedition porters like Kundan Singh, who has walked with the renowned author Bill Aitken (who wrote Nanda Devi Affair) and trained local boys like Sandeep, Gautam and Sidhu, who accompany us on the trek. We immediately organise our backpacks and do a short trek of 1.5 km to Lata Summer village, the traditional gateway to the Nanda Devi trek. After getting a taste of the local hospitality, we head into the forest above, frequently snatching views of the now diminishing village below. Kanuk is our first camp at 10,640 feet; then is Lata Kharak at 12,174 feet. The boys then walk us up to the view point ‘Saini Kharak’, which gives us a splendid view of the peaks of Dronagiri, Bethartoli, Nanda Ghunti, Trisul, and Devisthan. The Rishi Ganga gorge below is one of the most formidable gorges in the Himalayas; we keep walking along the ridge over broken boulders. After a short walk, we can see Nanda Devi in its full glory. The next morning, our forward journey to Dharansi Pass is cut short as the weather turns wicked. We are forced to return to our camp Lata Kharak. It's time now to start our steep descent towards Kadvi Chaun through thick forests of Birch and Fir to our last camp Tolma, a small village on the slopes of the valley. Tolma is our porter Govind?fs hometown and he has organised one-day homestay for us, thus ensuring that Tolma's locals have an equal opportunity to earn through tourism. The lessons of community tourism have been learnt well, surely.